Print your logo onto these custom printed nut2 smart tracker tag for valuables or one of our other innovative emergency & safety products and use them in your next marketing campaign as a unique giveaway item. Keep your valuables safe with these smart Nut2 tracker cards. The tracker Nut and Nut APP work together to help us find items, reminding us not forget to bring important items, you can also prevent children, pets and valuables missing. Importantly, users can make all the nut APP together to help us find the lost items and pets. Changes in the distance through the icon displayed on the page APP distance to find things on your phone and your items between; long press the button at the bottom right page to find things, items will sound and light tips; long press the button on the patch 2 seconds the phone will emit sound and light tips. Nut-Smart tracker to help find items and set reminders, (i.e. set a distance between you and the tag when you want to be alarmed that you might lose or forget something (like a wallet or keys). You can trace the last location of where your chip had been before you lost it to help you find it again by the trace feature in the app. Cost shown includes a 1 col print. We can do them with or without The Nut logo. Trackers are great for staff or keys for around the office to keep items from disappearing. Download the App from "www.nutspace.com", or App Store or Google Play, or scan the QR code to download it. Other innovative corporate gift ideas that could be suitable to create brand awareness include these cheap promotional Whistle Key Finders With Led Torch, quirky advertising gifts such as these Whistle Key Finders or how about using one of our more bespoke custom made products such as these great quality Alarm Smart Tracker Tags? Custom brand these cpr mask on keyrings or one of our best-selling promotional emergency & safety products with your company logo! 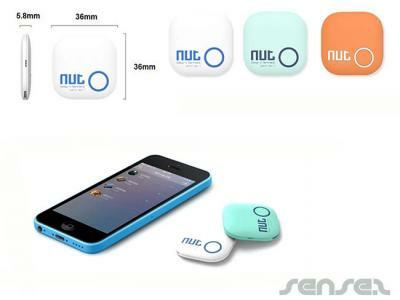 Your promotional nut2 smart tracker tag for valuables can be silk screen printed in 1 or more colours. Costs shown include a 1 colour logo print on your custom branded nut2 smart tracker tag for valuables. We can print more than 1 colour, however it incurs extra costs. We can achieve a perfect PMS colour match for the print. Personalise your nut2 smart tracker tag for valuables or custom design emergency & safety products for your marketing campaign. How can these unique promotional nut2 smart tracker tag for valuables or our personalised emergency & safety products fit in with your marketing strategy and help you maximise your brand exposure? Our custom made Nut2 Smart Tracker Tag for Valuables can be produced from a minimum quantity of 50 pieces. We can have your logo branded on these corporate Nut2 Smart Tracker Tag for Valuables in 1 Colour Silkscreen Print. A setup fee of AU$180.00 will apply to make the film.